While quartz was readily available in China and used alongside the more popular nephrite for small carvings, it did not come fully into its own as a material until the beginning of the Qing dynasty, the snuff bottle probably playing an important role in its popularity. One great advantage of crystalline quartz, when it is both colorless and relatively flawless, is that it allowed a snuff connoisseur to see the color and quality of the contents of the bottle through its walls. At its purest, represented by the present example, the material is completely clear and glass-like, as resilient as jade and cool to the touch. Its nature would have appealed greatly to the Chinese given their love of natural materials. 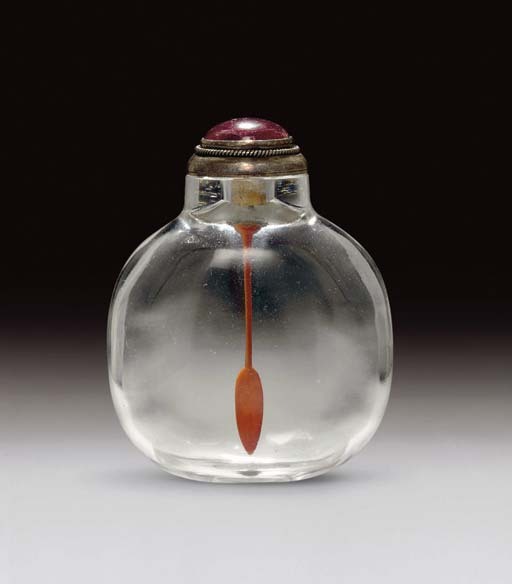 An undecorated flawless crystal snuff bottle of very similar shape is illustrated by Moss, Graham, Tsang, A Treasury of Chinese Snuff Bottles, Vol. 2, Quartz, no. 189. Another example is illustrated by Moss, Graham, Tsang, The Art of the Chinese Snuff Bottle. The J & J Collection, no. 93 (and sold in these rooms, 30 March 2005, lot 55). Two other bottles carved from flawless crystal are illustrated by M. Hughes, The Blair Bequest. Chinese Snuff Bottles from the Princeton University Art Museum, p. 54, nos. 24 and 25.